In Marin County on a beautiful, sunny day for a very short roadtrip, today's plan called for some easy drive-ups before heading back south across the Bay Area around noon, timed to avoid rush-hour during the morning or afternoon commutes. I've been slowly collecting all the available summits in the county, working my way north from the Golden Gate Bridge, visiting various parks, OSPs and the occasional private property in the process. The drive-ups through residential neighborhoods are more due to my OCD drive to be thorough, rather than any real pleasure in doing so. Located immediately north of downtown San Anselmo across Sir Francis Drake Blvd, there is nicely no development on the summit. It is quite small, no more than about 500ft from a road on all sides. The shortest approach is from the end of S. Grove Hill Ave on the east side, but one would have to hike through someone's property to get there. The guy who lives at the end of the street has gone to the trouble of asking Google to fuzz out his entire house on StreetView, so it appears he guards his privacy carefully. Have no fear. There is a use trail that zig-zags up the west side of the hill, what was once an old ranch road with very sharp turns. It can be accessed behind the Walgreens by following use trails up through the oak forest understory. There are some beer bottles, cans and other items littered about that tell of homeless or teenage drinking spots. There are no signs forbidding trespassing (or drinking, for that matter). The highpoint is a small rock outcrop with a rickety lawn chair set up for taking in the view more leisurely. Inside a hole at the top was a small, empty geocache cannister. A nice place to take in sunrise over the North Bay. Just north of Red Hill and a few minutes of driving is Grove Hill, completely developed. A large water tank sits at the highest point, though the adjacent road (East Lane) I drove up appears to be just as high. Lots of parking up here and room to turn around. Boring summit, though. This summit is found on the northwest side of San Rafael, a few minutes from downtown. Similar to Grove Hill, the highpoint is found near the end of Oakmont Ave, though the road is not the highpoint. That honor goes to a private home and the adjacent water tower. I actually got out here to climb a few steps and wander to the back of the water tank where it shares the property line with the private home and seems highest. You'll feel exceedingly foolish if spotted by the resident. No views on this one, either. A mile and a half north of San Rafael Hill, unnamed Peak 331ft lies adjacent to US101 between Santa Margarita Valley and Santa Venetia. The summit of this small hill is home of the Unitarian Universalist Congregation of Marin. The highpoint is located next to the parking lot, a nice little viewing deck with benches for contemplating the views and meticulously maintained trails and landscaping making for a pleasant walk that takes all of about 15sec. Kudos to the church for not building over it. On the otherhand, the church buildings themselves partially block the views to Mt. Tamalpais. Neat little place to visit. An undeveloped Hill 2mi further north along US101, Pacheco Hill is most easily visited from Marin Valley Dr. Signed for No Parking, the private road leads to a large mobile home community on the east side of the hill. Just before the road turns private, there is street parking adjacent to the freeway near the Hamilton Woods Apartments. I hiked up the private road a few hundred feet to access an old ranch road on the north side of the hill. A use trail weaves through the grassy stretch of road, getting one to the summit in a few minutes' time. The summit is open to views in most directions, with a dilapidated ranch fence harking back half a century or more. A very peaceful spot with fine views overlooking the North Bay. This unnamed summit lies in the Indian Valley OSP south of Novato. It can be accessed via the Indian Valley Fire Road either from the north (limited parking) or the south through the College of Marin's Indian Valley Campus off Ignacio Blvd. There is a fee to park here Mon-Sat according to the map, but I was oblivious to this at the time of my visit and don't recall seeing any signs regarding it. The closest parking is the far west end near the grass fields and the organic farm. The trail system circumnavigates the peak without any that reach the summit, but I found multiple ways to reach it up open grassy slopes and fairly benign forest understory. There was some fresh poison oak to avoid on the route I took down to the old quarry site on the south side, but with careful stepping I managed to avoid contact. The better, more open route was the ascent line from the east. Though less than a mile north of Peak 500ft, there is 4-5mi of driving required to get between the two from Ignacio Blvd. This fully developed summit sports a water tank at its highpoint near the end of Half Moon Rd. This road is quite narrow with steep driveways that makes turning around quite difficult, at least for the van. A crew was working atop the tank when I visited, so I didn't stop for longer than it took to take a photo. This small gem was the best of the summits I visited on the day. 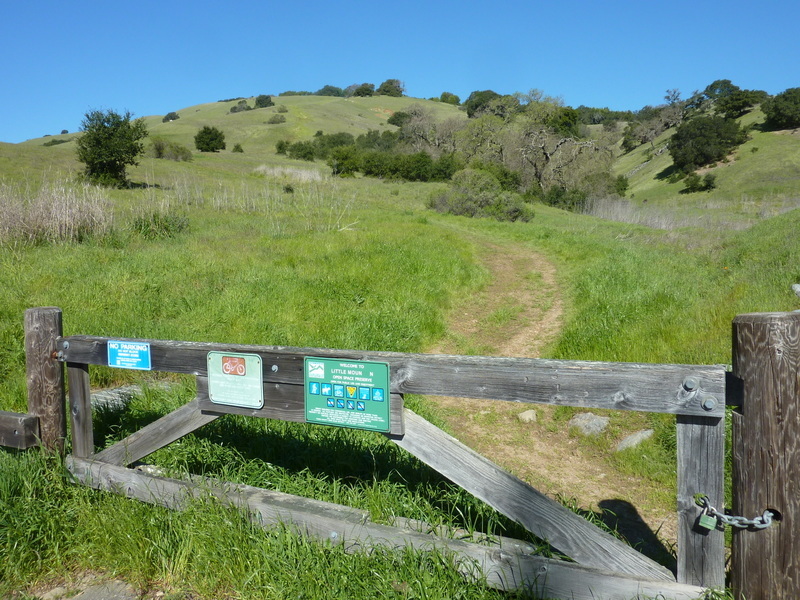 Located at the far west end of Novato, most of Little Mountain is located within the OSP of the same name. The map doesn't show any trails going to the summit, but there are various use trails that climb the steep, open grassy slopes to the top. I used a TH off Trish Drive that I got from peakbagger.com that worked nicely. I enjoyed the bright sunshine and open views so much that I decided to follow the use trail west after reaching the highpoint from the east. This led to an unsigned gate at a barbed-wire fence used to contain the cattle that graze the west side of the mountain and other lands below that are owned by the North Marin Water District and the Indian Valley Golf Club with no trail access. Oops. Rather than continue down the use trail to the base of the mountain on the west side, I dropped steeply down grass slopes to the south where I picked up the Doe Hill Fire Road that runs along the south side of the mountain and conveniently back to the TH.